Adjustment of response threshold for speed compared with accuracy instructions in two-choice decision-making tasks is associated with activation in the fronto-striatal network, including the pre-supplementary motor area (pre-SMA) and striatum (Forstmann et al., 2008). In contrast, increased response conservativeness is associated with activation of the subthalamic nucleus (STN) (Frank et al., 2007). We investigated the involvement of these regions in trial-by-trial adjustments of response threshold in humans, using a cued-trials task switching paradigm. Fully and partially informative switch cues produced more conservative thresholds than repeat cues. Repeat cues were associated with higher activation in pre-SMA and striatum than switch cues. For all cue types, individual variability in response threshold was associated with activation level in pre-SMA, with higher activation linked to lower threshold setting. In the striatum, this relationship was found for repeat cues only. These findings support the notion that pre-SMA biases the striatum to lower response threshold under more liberal response regimens. In contrast, a high threshold for switch cues was associated with greater activation in right STN, consistent with increasing response caution under conservative response regimens. 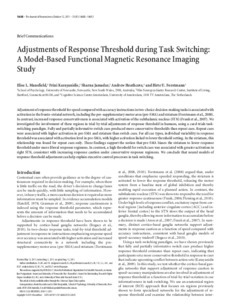 We conclude that neural models of response threshold adjustment can help explain executive control processes in task switching.